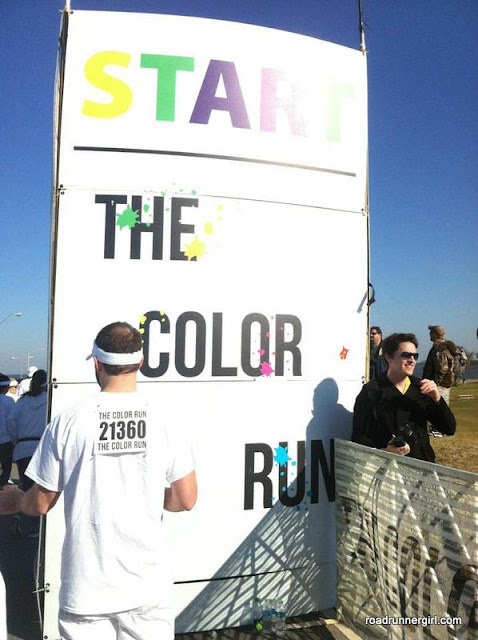 Road Runner Girl: The Color Run New Orleans with Swiftwick! This weekend was one that I have been looking forward to for a long time! The Color Run finally came somewhere close to me...New Orleans! As soon as I heard the news I registered...and I'm so glad I did because it sold out quickly! Thanks to Larisa at Zero to Twenty Six Point Two, I was also lucky enough to represent Swiftwick Socks at The Color Run! Swiftwick gave us some awesome fit gear...a Swiftwick tech shirt, Swiftwick arm sleeves, and Swiftwick compression socks! The tech shirt was awesome...made of the wicking material that I love! I was really interested in the arm sleeves because I've never worn any. I don't have the slimmest arms so I didn't know if I would like them. But I loved them!!! They didn't ride down my arms and they kept me warm. And if you get hot all you have to do is push them down and take them off...a lot easier than trying to get a long sleeve shirt off while running lol! I couldn't wait to try the Swiftwick compression socks! I LOVE compression socks! These were awesome! They were tight enough to give me the right amount of compression but not so tight that they hurt. And Swiftwick says they "make the best socks you will ever wear.... GUARANTEED!" The socks are supposed to fit like a new sock each and every time you wear them....I'm all for that! I do know that they felt great during the Color Run! I can't wait to try them on a long run and for recovery! The only negative thing I have to say is that they don't have the compression socks in enough colors...they only have black and white. This girl needs some pink, purple, yellow, green, blue, and red!!! As always...here's my picture of my race gear the night before! We carbed up at the Louisiana Pizza Kitchen! Sooo yummy! If you ever visit New Orleans you MUST eat here! I (of course) got my usual night before the race meal...pizza!!! All of us at dinner (minus Larisa who was taking the picture)! After dinner we experienced the nightlife of New Orleans! And saw some crazies out there for sure! I slept really well that night (it could have been due to my long day of the Twilight Marathon the day before) and woke up feeling rested. I got dressed in my full Swiftwick gear! And I did something I never do before a race....I didn't eat a thing. Ok well I did eat something. We rode in my friend Jennifer's car with her husband and 3 kids. And they offered me some oreos lol! So I ate oreos as my pre-race fuel! I WAS prepared with a Luna bar but I left it in my suitcase. Oh well! We made it to the race (after sitting in traffic for about half an hour) and met up with all my other Swiftwick peeps! Not only was Larisa there but Gina with Noshing on Asphalt was there too! We had an awesome Swiftwick photo shoot! And then it was time to head to the start line! There were so many people!!! I read there were around 10,000 people there!!! I was a little worried about running this race because I had to run 18 miles the next day for marathon training. I knew I wanted to take it easy. We started out running pretty slow. But with so many people...you couldn't run very well. Most of the people were walking. So Paige, Stephanie, and I decided to stay with Jennifer and her family and walk the race. And we had a BLAST!!! We didn't worry about our time, took lots of pictures, and spent as much time as we wanted at each color station! And it was so much fun watching Jennifer's kids! It was soooo fun! The first color station was ORANGE! The next color station was BLUE! And then we were finished! And we had a blast throwing our color packets up in the air!!! And took a ton more pics of us all colorful! This race was so much fun! I'm not sure it was a full 5K (which would have irritated me if I actually ran it) and it was super crowded. But when you sign up for a race like this that is more about having fun then the run itself...then it's ok with me! I'd definitely recommend The Color Run...just as a fun run. The race isn't even timed. But the concept is a blast and the after party is fabulous!!! Thanks again to Swiftwick for helping me look so cute for The Color Run!!! QOTD: What is the craziest race you've ever run?